The Faculty of Engineering and Technology at Al-Zaytoonah University organized a workshop for its senior students entitled: “Senior Design Projects: Objectives and Goals”. The workshop was implemented by Dr. Rashad M. Hanbali, P.E., PTOE. Dr. Hanbali indicated that the senior design project is the capstone of design education in engineering and technology at Al – Zaytoonah University of Jordan. It concludes the series of required design courses. The senior design project is a set of two required design courses that students usually take in their last two semesters of study. Dr. Hanbali explained that the senior design capstone is a required component of an accredited engineering program. He added that the desired objectives of a senior design project are to incorporate real-world experience into the curriculum, develop ability to apply acquired knowledge to solve engineering problems and to design realistic systems, components, and/or processes, in addition to develop ability to function in a team environment to gain organizational and communication skills and to understand professional and ethical responsibilities. Dr. Hanbali explained the process of developing a senior design capstone and stated that the end-result of these efforts is a product that meaningfully adds value to the participants including students, advisor, and faculty. Dr. Hanbali answered several students and attendees questions. Faculty of Engineering and Technology held a workshop between Oct 7-9, 2018 in Public Safety and attended by the faculty laboratories supervisors. The workshop was coordinated by Engineer Monther Khader. Civil Revolution Union affiliated with the Al Zaytoonah University of Jordan Student Union facilitated a series of short training courses in software applications in civil engineering (prokon, primavera, E-tabs, etc.). The short courses were organized at Pioneer Academy Center between August 8, 2018 to August 29, 2018. Civil and Infrastructure Engineering Department organized a cultural day on Dec 17, 2017. The event activities were attended by students and faculty. Attended students engaged in various activities during this event. Sixteen of our CIE students attended a seminar titled “Ethics of the Profession” at the Jordan Engineers Association on August 8, 2018. The seminar was facilitated by the CIE instructor Engineer Raha Alkhrabsheh as a part of the Technical Writing Course. On July 16, 2018, the Faculty of Engineering and Technology held a meeting with the members of the faculty Industrial Advisory Board to discuss different issues related to the local industry contributions to the faculty educational process. Members of the faculty Student Advisory Board participated in this meeting. The students of the CIE department organized and participated in a book exchange campaign between 14/10/2018 to 17/10/2018. The campaign was held at the CIE department. On April 17, 2018, the President of the University; Prof Turkey Obaidat honored a number of students participated in the “First Poetry Forum” competition. The university president encouraged students to participate in extra-curricula activities to enrich their university wide experience. The University President, honored the two Civil Engineering and Infrastructure Department (Mohammed Khalaf and Mohammed Khaldoun) for their participation in the competition. The faculty of Engineering and Technology has organized a seminar of the senior engineering students graduating projects. 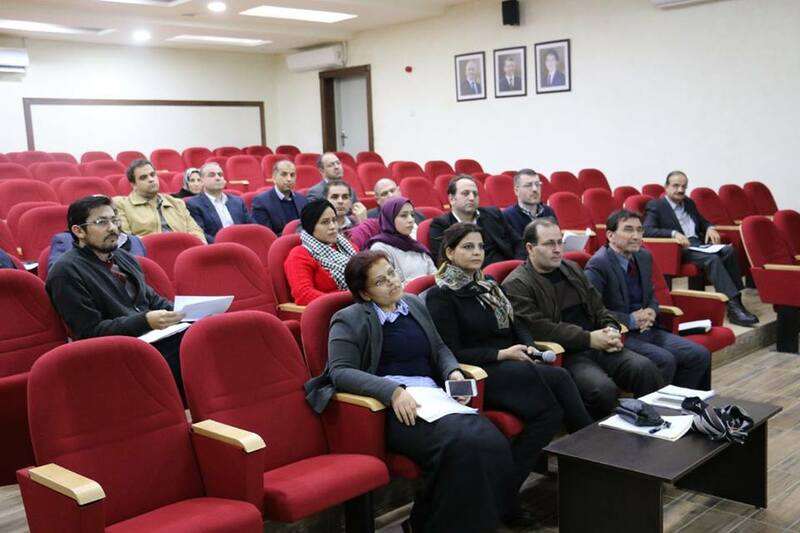 Professor Wejdan Abu-Elhaija, the vice president of scientific faculties and the dean of Engineering and Technology Faculty, and many of the faculty staff attended the seminar. This seminar has been organized by Civil and Infrastructure engineering (CIE) department. Two faculty members of CIE department; Professor Subhi Bazlamit (The dean of scientific research and graduate studies) and Dr. Fawzi Gharagheer presented the seminar. Prof. Bazlamit and Dr. Gharagheer made a comprehensive presentation. They focused on the basics and mechanism on how to supervise the senior students in their graduating projects and how to evaluate their work based on ABET accreditation requirements. At the end, Prof. Bazlamit and Dr. Fawzi answered the questions of the audience.